THIS JUST IN . . . added our Residential Refrigerator Upgrade to the Projects pages. 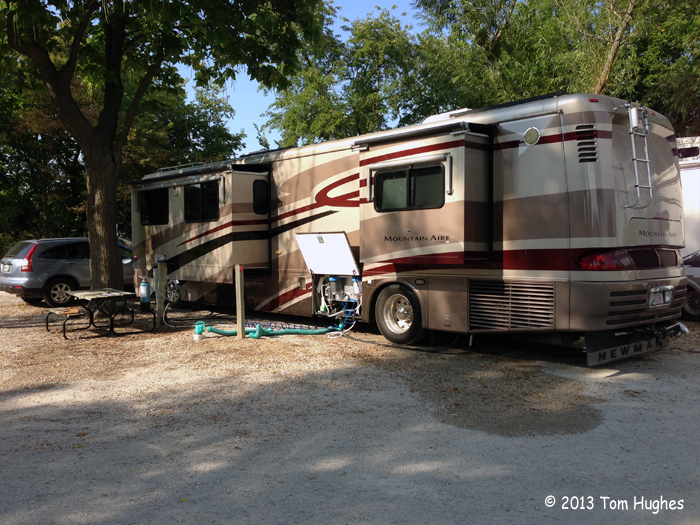 We left Geneseo, IL fairly early (for us) and planned on camping in Walnut Woods State Park near Des Moines, IA. However, we couldn’t find out if any campsites were available, so we looked for a Plan B and found Timberline Campground in Waukee, IA. We arrived in the early afternoon. I spent much of the day rejuvenating our water filtration system which meant replacing two water filters (sediment and carbon block), recharging the water softener, and flushing the water holding tank. Yipee! And in 90 degree heat and humidity. However, Jan did the most important work. She scored a great meal from a local Paneras and bought some Danish for breakfast tomorrow. NEXT STOP: Colorado Springs or Bust. We have reservations for Sept 17, but they’ll be a few stops before we arrive. You did a good lick of work on your refrigerator project. By now you must have a whole new RV. Good show, Jan, I like Panera too and have a card. Every time I buy something there, they credit my Panera card with a goodie or two which I pick up the next time I go there. Yum. I liked Colorado Springs. That’s where the famous Broadmoor Hotel is………the one that was made famous in that Jack Nicholson movie………..forgot the name, but the little kid in the movie keeps writing REDRUM on mirrors and it takes his parents forever to figure out what that really means. Huh? Happy trails, Kath. That’s the Overlook Hotel in King’s novel. I think they actually filmed in the Stanley Hotel near Estes Park, CO.
We will, of course, avoid both! And, yes, at this rate we’ll have a new RV soon.